You recall, brothers and sisters, our toil and drudgery. Working night and day in order not to burden any of you, we proclaimed to you the Gospel of God. You are witnesses, and so is God, how devoutly and justly and blamelessly we behaved toward you believers. As you know, we treated each one of you as a father treats his children, exhorting and encouraging you and insisting that you walk in a manner worthy of the God who calls you into his Kingdom and glory. And for this reason we too give thanks to God unceasingly, that, in receiving the word of God from hearing us, you received it not as the word of men, but as it truly is, the word of God, which is now at work in you who believe. As I said in the introduction of the Holy Mass, we celebrate today one of the more important saints in our Catholic liturgy. We celebrate today the feast of Saint Augustine. Actually, there are many things that we can learn from the life of Saint Augustine. But I would like to highlight three important things. First is the importance of the prayer of parents. If you went to mass yesterday, you will discover that yesterday was the feast of Saint Monica. And who is Saint Monica? She is the mother of Saint Augustine. And according to the life of Saint Augustine, we know that from the early years of his life, he lived a life so far away from the Lord. Hindi naman siya ipinanganak na banal eh. He lived a very loose kind of life. But it was the prayer of his mother, Monica - na araw-araw na ginawa ng Diyos ay nananalangin at lumuluha para sa kanyang anak - that became one of the determining factors, according to Augustine, of his own conversion. Kaya siguro ang mga magulang dito, siguro meron din sa inyong mayroong mga anak na katulad si San Agustin, do not lose heart. The prayer of a parent is something that is very powerful. So continue praying for our young children. Second, there is the influence of St. Ambrose on Augustine. In one of the sermons of St. Ambrose at the Cathedral in Milan, Augustine happened to be listening. Kayong mga nakarating na doon sa Milan, there is a very big cathedral dedicated to St. Ambrose. And it was there that one time, when Ambrose was preaching, and Augustine happened to be at the back, he said that there was something that attracted him to the words of Ambrose. And it began Augustine's thirst for the Word of God. Lastly, there is the importance of personal prayer in the life of Saint Augustine. His conversion transpired when one day, he was sitting in his balcony, and he saw a book - the Bible. And then he heard a voice saying 'Tolle lege.' It is Latin for 'Take up and read.' Augustine, then, opened the book, and it was the Sacred Scriptures. That began his path to conversion. We can learn so many things in the life of Saint Augustine. And he wrote many things. But there is one particular verse that he wrote in his confession that I would like to read to you today. Kilalang kilala si Saint Augustine sa mga salitang ito, at ito ang kanyang sinabi. Ang sabi niya, "Late have I loved You, oh Beauty, ever ancient and ever new, late have I loved You. You were within me, but I was outside, and it was there that I searched for you." He was talking to God. He called God 'a beauty, ever ancient and ever new'. What is Saint Augustine saying here? Meron pong kasabihan na 'you will never forget your first kiss'. Totoo po ba 'yon? Di kasi ako maka-relate. (laughs) Sabi nila, hindi mo raw makakalimutan ang iyong first kiss, kasi that is the first time that you felt loved. Saint Augustine also said that. You will never forget your first kiss. But the first kiss that he is referring to is not the romantic kiss. Saint Augustine is saying that our very first kiss is actually the kiss of the Lord - when God first created us. He kissed us in our soul. And that is why according to Augustine, there is a hunger in our soul that will never be quenched. Augustine realized that our first kiss is nothing in this world, but it is outside of the world. That is why he said, "Late have I loved You, oh Beauty, ever ancient and ever new." God was inside of him, but Augustine was looking for God in the outside. As a closing, let me relate to you one story that I read. There was a man and his child, and they were eating. While they were eating, the father noticed his child, dinidilaan 'yong fly swatter, 'yong pamatay ng langaw. Nakuha ng anak niya 'yong pamatay ng langaw at didilaan. Ano'ng gagawin ninyo kung kayo ang magulang? Syempre aalisin ninyo - you will get the fly swatter and replace it with a popsicle. And then the father told the child, 'Sige, 'yan ang dilaan mo nang dilaan'. What is the story telling us? Minsan, kung tayo 'yong magulang, baka pinalo mo agad 'yong anak. Baka sinampal mo agad ang iyong anak, 'Bad 'yan, bad 'yan, dirty 'yan.' But what the story is telling us, is that the problem is not the desire. The problem is where you go to satisfy that desire. That child was looking for something. Kaya lang ano'ng nangyari? He saw the fly swatter, at doon niya gustong i-satisfy 'yong kanyang desire. Ano'ng ginawa ng Tatay? He replaced it with something that will truly satisfy the desire of the child. Ganoon din ang itinuturo sa atin ni San Agustin. Sabi niya, all of us have this desire inside of our heart. Ang pagkakamali natin, we bring it to something less than God. Saint Augustine is telling us that the human heart is wired for God. The human heart is made for God. And it will only be satisfied, if we bring it to God. If we bring it to something less than God, what will happen? It will bring us to ruin. But if we bring our desire to something that is of God, then we will be truly satisfied. 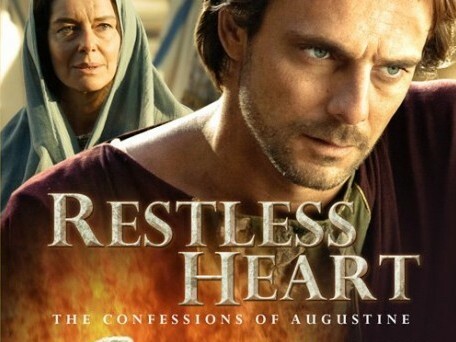 In the end, Saint Augustine says that our hearts are restless, until they rest in God. In this mass, let us make it our own prayer. You have made us, oh, Lord, for yourself, and our hearts are restless until they rest in you. Amen.